Boston is set to get a ‘lion’s share’ of a £4 million investment across health services in Lincolnshire to prepare for winter. The board at United Lincolnshire Hospitals Trust, which runs Pilgrim Hospital, has put the money aside to help deal with the added pressures the season brings. Across the trust the money will pay for new staff, beds and other facilities. At Pilgrim, one hope is to re-open up to 48 beds, 22 on the wards and 26 at the ‘front of house’ in accident and emergency. Director of Operations at the site Tina White said this would not mean the re-opening of wards such as 8B, which was closed in 2013, and some of the ‘beds’ would include reclining chairs and trolleys. The aim is to more effectively stream patients to where they would be most suited and dealing with those who can be seen within 12 hours. And for those patients who are seen within 48 hours it would mean they have a place for a short stay. Mrs White described the allocation of funding coming to Boston as the ‘lion’s share’. It follows an unexpectedly busy period in the first three months of the financial year from April 1 to June 30, with attendances in the three A&Es increased by 4.3 per cent (6,419 people). Mrs White said: “Usually when we prepare for winter, we get funding from the CCG (Clinical Commissioning Groups) starting in November and running to the end of March. But the reality is, the whole trust has seen an increase of attendance and admittance to A&E. 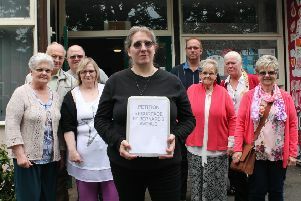 She said part of the reason was the population of Skegness trebling during tourist season and a lack of funding for social care in the community. Other investments include 100 new staff, of which 22 will go to Boston, with others going to Lincoln, new IT systems and more.